“When San Francisco began to consider duplicating its famous Bay Bridge, running the second alongside the first, Mr. Wright felt that something should be done to stop that. Something better suited to the times and their needs, to the superb scenery of the area, something more scientific, simpler, quieter could be designed. In the summer of 1949 the drawings shown here were made after Mr. Wright was assured of the support of an internationally renowned engineer, J. J. Polivka, residing in San Francisco. 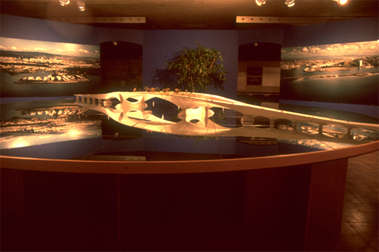 Frank Lloyd Wright’s “Butterfly Wing Bridge” was originally intended as a southern crossing of the San Francisco Bay, connecting from its western terminus at approximately Army Street (now Chavez) and Third Street to its eastern terminus upon Bay Farm Island, just north of the Oakland Airport. It was primarily a low, water-hugging viaduct of reinforced concrete until it reached the ship channel where it gradually rose up to become a graceful archway spanning 2,000 feet. At the same time the opposing roadways divided and bowed out. At the center of this arch and its highest point, a disk of reinforced concrete fans out from each roadway across the opening between and merge at their tangent. This allows cars to pull out of traffic and park, and beyond, a lush, planted garden that individuals can leave their cars to enjoy rest and pleasant views of the San Francisco Bay.